Winter, it’s a time to be cosy. Here at Pipe Scenes, we associate winter with large mugs of hot chocolate, bundles of blankets as you watch the soaps and most importantly the bubbliest baths you could imagine. There is nothing better than a hot bath that relaxes you and warms you! This is why we always say to make sure your bathroom designs make you feel comfortable. It’s the one place you can truly be yourself and just relax. With this in mind, we have put together six interior design tips that you should consider for your bathrooms. Each footed bath leaves a space under the baths fitting, which can make a small space seem larger. You can highlight this space with a pool of light sitting under the bath. This creates the perfect mood lighting and is practical if you awake during the night to use the bathroom, you can switch this light on rather than using the harsh light. The basin is one of the most important features to any bathroom. However, there is a fine line between making your bathroom look like an additional room rather than a hotel bathroom. You can achieve this through your vanity units. Why not house your basin in a piece of furniture? It works well to increase the storage space in your bathroom and avoids leaving clutter on your shelves. Every bathroom should be organised, with draws and cupboards to store the daily makeup or grooming routine. Finish it off by featuring a stunning mirror above the unit, along with lighting around it. 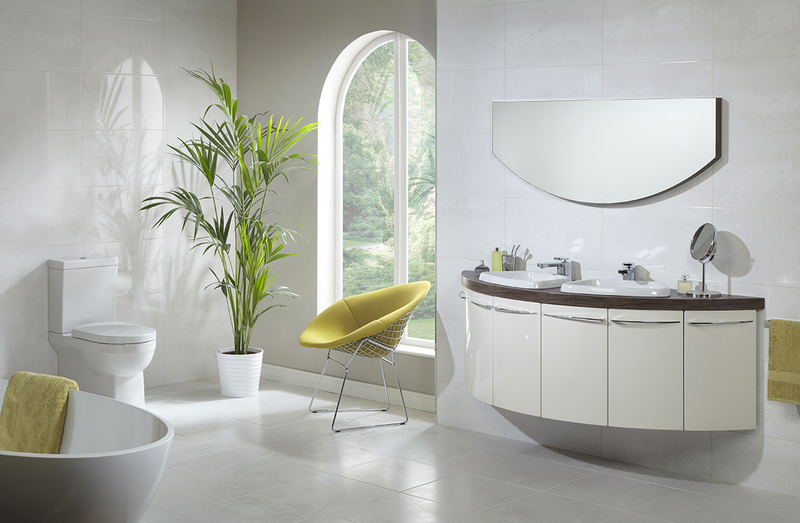 We have a fantastic range of illuminated mirrors in our Utopia range, which can be viewed at our showroom. By the way, the lighting makes the best selfies! Your bathroom should be stylish, practical and most importantly comfortable. Choose tiles, wood or marble for your bathroom flooring. They are easier to maintain and clean, plus they can add a feature of colour or pattern to your bathrooms. We are so used to opening the bathroom door and straight away making eye contact with the house toilet. But what if we told you, you don’t have to place it there? Why not mix it up and place it around the side so you are greeted by candles, a mirror, flowers, a bath or basin? With L-shaped bathrooms, you can easily place your toilets round the corner. With this you could also feature a small basket filled with toilet rolls, adding a practical feature to your bathroom. There are two levels of lighting that you could add to your bathrooms. One focuses on lighting the bathroom, this can be through spotlights, chandelier lighting or automatic lighting systems, so when you enter the room you don’t have to fumble around for the light switch. The other lighting is for makeup and grooming purposes. This creates a highlighting feature, that focuses on your face. We suggest choosing an illuminated mirror for this. Don’t forget to use your lighting practically and install a dimmer to create mood lighting. Perfect for when you’re relaxing in a bath with scented candles. If you have a guest bathroom, you may find that they are significantly smaller than the master en-suites. But don’t worry you can work with a small space – with the right tools. Choose a generously sized shower, rather than an undersized bath. The bath will make your bathroom seem cramped and uncomfortable. We hope you have found this useful! For more design tips follow us on Facebook and Twitter! Alternatively call us on 023 8055 7555 to speak with a member of our team!